No matter what Bill it was, I'm sure it was full of a lot of extra spending. He wanted school buses to stop before railroad crossings. Sorry to dissapoint you but Liliy is right is was for the school buses. 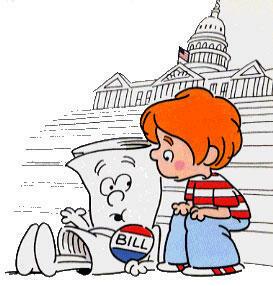 I grew up on school house rock as well and learned so much from it. It is funny that you mentioned this because on Monday was Constitution day and they played this song in the morning at my school. Most of the teachers (including me) were singing along and my kids are going huh? What is this? I vote to bring it back on the air. I want School House Rock ringtones! Thanks a lot, Martin. I'm going to be singing that song all night now. I, yes I, have the Schoolhouse Rock CD! I don't watch Saturday morning cartoons, but is anything remotely as educational or entertaining on these days? You can actually get the lyrics to most of the Schoolhouse Rocks on line. I used them to do an educational program at work. The sad part was that the "grown ups" in the room looked at me like I was nuts! Made me feel bad for them. How could you NOT know and Interplanet Janet or good ol' Bill? Come on!